It had been a while but Team Merlot were back at Woodbridge Airfield for a Javelin Track day on Saturday 13 September. That was the most fun I've had in Project Merlot for a long time. The car behaved impeccably again and nursed a couple of trackday virgins through their day - despite efforts to upset her. The higher tyre pressures - intended to prolong tread life - made the rear a little tail happy, but in a fun and controllable style. I got some wicked powerslides onto the runway. Rob, the Bridgestones seem to have cured the horrific understeer we used to get at certain corners, but i feel a LSD would still be a good investment. I don't know what happened to Teresa, she seemed happy enough after a few laps with me but never wanted to go out on track again after her time with Jason. Sorry about your nails btw. And James impoved beyond all recognition after his session with the racing instructor. I know that Merlot thanks you for investing that £20 too! It's nice to know that Martin isn't the only one-handed knob-fondler in the East! All-in-all it was a fantastic day with a great bunch of people, huge thanks also to Steve, Ian and Katie for bringing their track specials along and keep the ER Motorsport flag flying high. 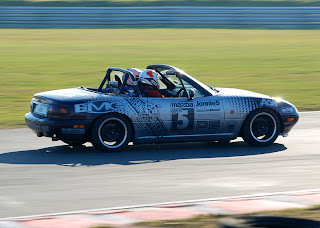 Saturday totally re-ignited my passion for trackdays - I can't wait for the next one, although I do ache all over! What i would give for a smooth track!! 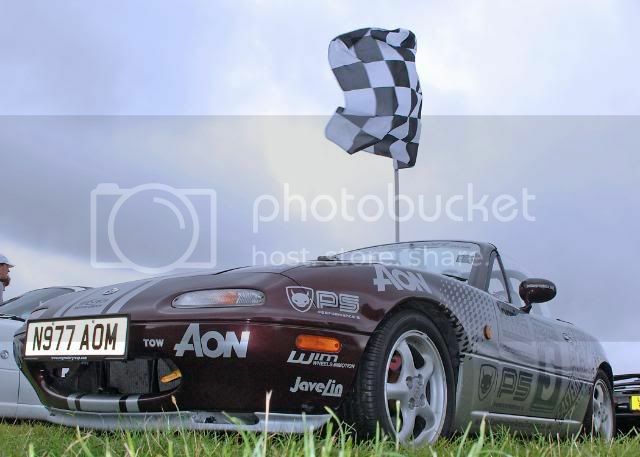 The Merlot is centre stage for the MX-5 Owners Club National Rally at Belvoir Castle as Robbie Marsh dismantles it and puts it all back together for the entertainment and enlightenment of the assembled Owners Club members. The Merlot joins the crowds and the 5s on the MX-5 Owners Club Eastern Region stand at the Norfolk Police Gala day. Merlot on show at the Helmingham Festival of Classic and Sports Cars flying the flag for the MX-5 Owners Club. Pro. Mer. 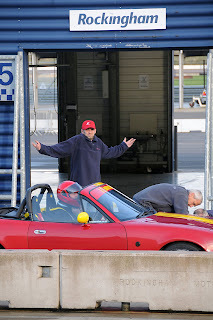 at the Le Mans 24hr..
Jonnie Boy and Roadster Robbie take Project Merlot to Le Mans. 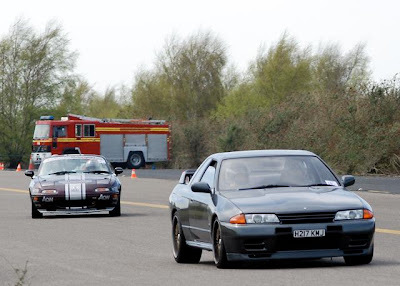 It was back to our favourite track at Woodbridge Airfield on Saturday 31 May. The day saw a return to the wheel of Merlot fan Katie Pyle and Chris Gage of sponsors Cambridge Area Training. 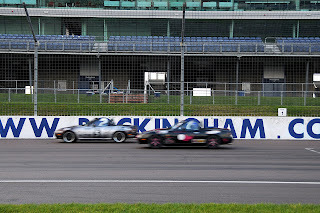 The Merlot was not the only MX-5 Owners Club track car on the circuit today as making its second appearance at Woodbridge was the Reds Motorsport Roadster of Steve Hider and the white Roadster of Martin making its first ever proper track appearance. Project Merlot goes to the seaside! 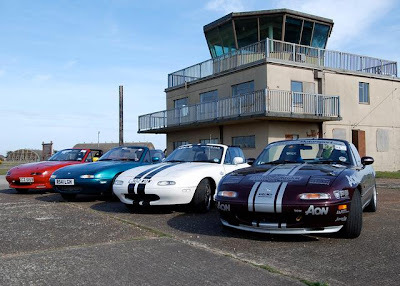 Following the MX-5 Owners Club Spring Rally Team Merlot spent a few days in the West Country. The Merlot got the rare opportunity to visit the beach and make sand castles! And not forgetting a memorable drive through Cheddar Gorge. Sprint to the line at Haynes. 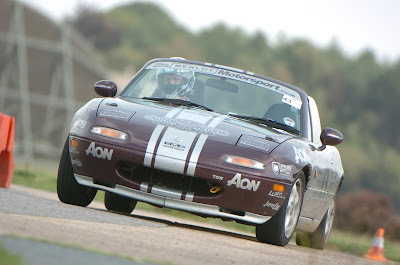 Sunday 18 May saw Project Merlot at the MX-5 Owners Club Spring Rally at the Haynes Motor Museum in Somerset. Hyanes best kept secret is the sprint track and this was made available to the Owners Club for the day. The Merlot was to be seen throughout the day on the track making it a most memorable rally for two more Club members who had their first drive in the car. New boys James Huggins and Ady Neill took to the wheel along with the regular Merlot crew of Martin, Robbie and Jon. It was panic stations however with minutes to go before the first session as a helpful soul in the crowd spotted that a couple of the Merlot's tyres were on the wrong way around. In an effort worthy of the best F1 pit crew the wheels were soon swapped and the car took to the track with moments to spare. Back again, for more action with Javelin Track Days at our home circuit, Woodbridge Airfield. After the last time we visited Woodbridge, with Gales force winds and the resultant shorter track, this time we were back on a longer circuit, albeit with some changes from the 2007 layout. Drivers today were Merlot co-owner Martin Curtis and retuning driver and sponsor, Chris Gage from Cambridge Area Training, together with two more Merlot virgins, Andrew Evans and Tracey Sparling. Just for a change the weather was kind to us, no showers, no wind and sunshine most of the day. After all the hard work Robbie Marsh had put in during the Merlot’s April refresher this was actually the first time the Team had ever taken the car out on track without Robbie in support, as he was on holiday, and it was not without some trepidation that the first few sessions were undertaken. Jon Elsey came along but took on the role of official track photographer for the day leaving the car in the hands of Martin all day, who is not certainly not know for his mechanical skills! We need not have worried though as the car did not miss a beat all day long. Tracey spun the car on her first trip out but undaunted carried on. Chris also had a spin, but had a really good excuse for us all when he retuned to the pits! Project Merlot spent the first 2 weeks in April perched on a 2 post vehicle lift in the warm confines of the Cambridge Branch of EMG Motor Groups' modern, spacious workshop. The car has been undergoing some transplant & cosmetic surgery in preparation for the next visit to Woodbridge airfield with Javelin Trackdays. A new clutch assembly kindly supplied by EMG Motor Group was installed along with a new gear change lever dust boot and the box filled with fresh 75W90 gear oil in an attempt to aid the failing 3rd gear syncromesh evident at the recent Woodbridge event. I also changed the clutch fluid. A powerflow made cat-back exhaust system donated by Ady Neill (solargraphics.net) with a 3" tip now replaces the decrepid and failing Bosal system the car had been dragging around since the team had bought it. Next, I removed the Axxis Ultimate brake pads from the front and fitted a set of EBC Green Stuff pads (donated by Eastern Region member Ailsa Thompson). Here it must be stated how well the Axxis Ultimates had lasted. After just one track day we were finding that Mazda pads were melting from the heat and needed at least a clean up and re-face before the next event. The Axxis Ultimates however have lasted for 5 events untouched and when removed, purely because they were looking a bit worn and we didn't want them to wear out mid event, they showed no signs of over heating at all. This is a brake pad I would happily reccomend and I hope the EBC's fitted now are as commendable. While the wheels were off I also changed the brake fluid. The boot lid with its characteristic maybe even sentimental dents & holes has now been consigned to the skip in exchange for the new lid which was supplied by Dandycars and painted by DWR. Project Merlot can be seen at Woodbridge Airfield with Javelin Trackdays on April 26th. Our first trip back of 2008 to Woodbridge Airfield with Javelin Track Days and what a day! Gale force winds over night had removed all traces of cones by the morning and therefore no track to be seen! Thankfully some very early morning action by the Javelin crew put most of it back together before we arrived but with the strong wind persisting they decided that the main runway section would just be too windy to drive safely so we ended up with a shorter, but no less interesting track. Drivers today were Martin Curtis and Jon Elsey, with two new boys to the Merlot, John Mellor and Jamie Tink. We started off the day on Toyo track tyres but by lunch time the more severe corners of the shorter track were taking there toll on these so a sprint back to Martin’s for a replacement set of wheels and tyres was necessary. This made the day even more interesting. A morning session on the semi slick and an afternoon on regular road tyres showed up just how much the handling can change with a different tyre. By the end of the day we had pretty much removed all the tread from the offside front tyre and worst still we were having a few problems selecting gears. After a sabbatical from Snetterton circuit Project Merlot returned on 17th February for its 3rd visit to the track, this time with Javelin Trackdays. The morning, although cold at -4°c was dry and clear and the day remained so through out the event with temperatures climbing up to 6°c by the afternoon. Project Merlot saw the return of Steve Hider (soon to be out with his very own track prepared Roadster), Tony “Dad” Brown & Robbie Marsh to the driving seat and added a new name to the already distinguished list of Merlot drivers, Steve Alleyne. It was the first time Mr Alleyne had driven any car on any circuit so not only were his nerves tense but so were the nerves of the Team! After signing on and listening to the briefing all drivers were sent out in 3 groups for sighting laps. Steve Alleyne, obviously keen to get out on track used his own car for this only to return to the pit lane after 3 laps to be told he should have been wearing his crash helmet!!! The circuit opened at around 9:30 and from then until five o’clock with only one hours rest for lunch the car was subjected to the extremes of driving that it has taken in its stride over the past 18 months. Since Team Melot last visited the circuit they have fitted FM Anti Roll bars, installed polybushes and are now running Toyo R888’s making the car even better under track conditions. Tony, who paid for 20 minutes instruction from an ARDS instructor, said “The car certainly handles better compared to the last time I drove it. I even passed a few cars”. Once Steve had got used to being able to use the whole “road” he said “Wow! Fantastic day I will definitely be doing this again, thanks to Robbie, Steve and Tony for showing me the ropes. I can’t wait to see the video”. 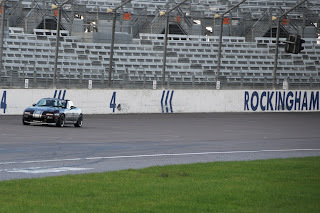 In total Project Merlot clocked up 297 miles on the track that day and used £103 worth of fuel. 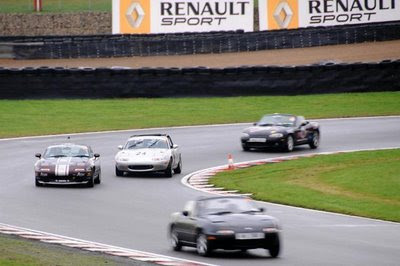 Strangely enough, the last time we visited Snetterton we did 294 miles!